MFA becomes the first in Australia to implement the new innovative SmartGoals system to their football curriculum. SmartGoals is an innovative sports system for all abilities. SmartGoals is used by grassroots up to the Champions League. You can score in every SmartGoals that lights up. Scoring can be done by running, shooting, dribbling etc. through the SmartGoal that lights up. After a score a new random SmartGoal will light up and that is the new target. This change in target creates a continuous challenge to score as fast as possible for players at every level and in different types of exercises. SmartGoals creates dynamic and fun exercises and you will encounter a feeling of success every time you score a goal. 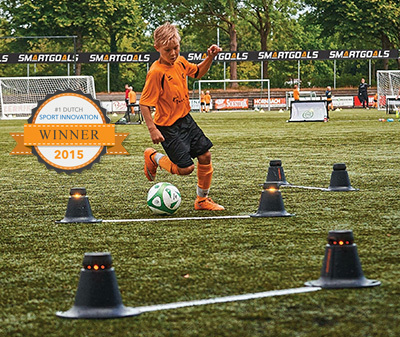 SmartGoals is a product developed and produced in the Netherlands. The start-up company is a cooperation between the Eindhoven university of technology, the city of Eindhoven, Spinnov and the VDL-Group.